"For him, your voice is opera." Screen Media Films has debuted the official trailer for an intense romantic drama titled Bel Canto, based on the best-selling novel of the same name written by Ann Patchett. Inspired by the events of the Japanese embassy hostage crisis (also called the Lima hostage crisis) of 1996-1997 in Lima, Peru, the novel has received several awards including the Orange Prize for Fiction and PEN/Faulkner Award for Fiction. The intimate, tense love story is about a famous soprano, played by Julianne Moore, who gets entangled with a wealthy Japanese industrialist, played by Ken Watanabe. She travels down to the embassy in South America, and falls for him while being held hostage. Also starring Sebastian Koch, Christopher Lambert, Ryo Kase, Tenoch Huerta, and María Mercedes Coroy. Take a look below. Based on the award-winning novel, this dramatic love story follows a famous soprano (Julianne Moore) who travels to a military dictatorship in South America to give a private concert at the lavish birthday party for a wealthy Japanese industrialist (Ken Watanabe). Just as the handsome gathering convenes, the house is taken over by a guerrilla rebel group demanding the release of their imprisoned comrades. As a lengthy standoff ensues, hostages and captors form unexpected bonds as they overcome their differences and find their shared humanity. Bel Canto is directed by American filmmaker Paul Weitz, of the films American Pie, Down to Earth, About a Boy, In Good Company, American Dreamz, Cirque du Freak: The Vampire's Assistant, Little Fockers, Being Flynn, Admission, and Grandma previously. The screenplay is written by Paul Weitz and Anthony Weintraub; based on the book by Ann Patchett. 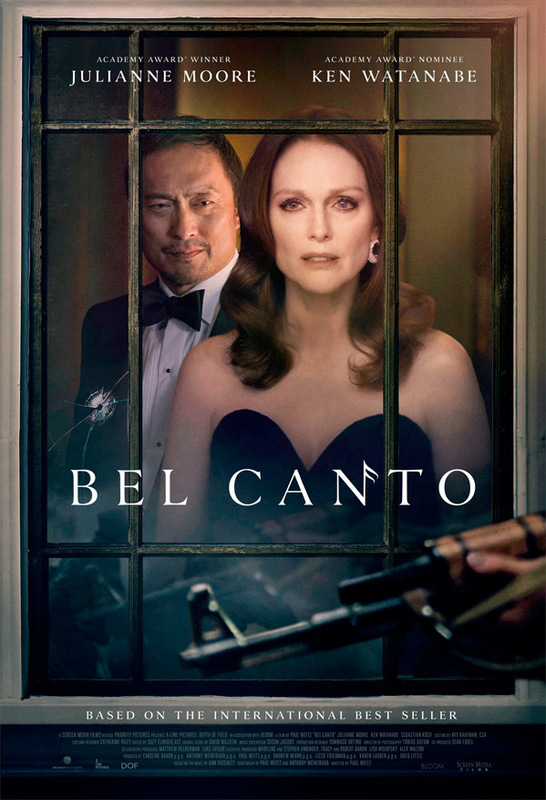 Screen Media Films will release Weitz's Bel Canto in select theaters starting September 14th in the fall. Anyone interested in this?